To volunteer for charitable campaign events or check for new requests, go to Heifer’s Google docs. As of September most dates were staffed but because new opportunities keep coming in, please continue checking for new posts. Jill Kilty-Newburn suggested that we keep it simple by providing brochures with contact information, World Arks and one or two annual reports for reference material. We were also asked to make available brochures and other items from Jim Hill, local representative for Global Impact. Global Impact is the charitable federation umbrella group for international health and welfare agencies participating in employee fund-raising campaigns; Heifer is among its non-profits. A photo and a short write up about your event can be e-mailed to Teresa Fung for posting on our blog. Susan Sundell will be out of town from October 5th -14th. If you need materials contact her before then. As a back up, Judy Grimshaw will have a key to the materials garage. Call on her if you need something, while Susan is gone. 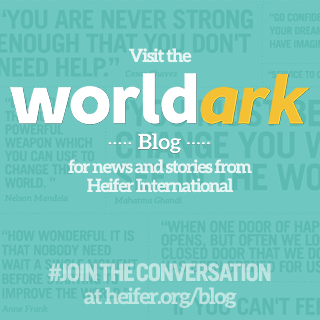 Jill reported that the Team Heifer site is being revamped and she will have more information in the near future. Since that site is not yet functioning, it was suggested that we keep track of our progress toward meeting our goal of raising $10,000 this year on our own Heifer blog. Jill will be tracking the contributions made to Heifer through the state and federal charitable giving campaigns we have been working on and supporting this fall. That should give us an idea of the impact of our efforts. New Read to Feed materials and an Alternative Gift Giving mailer may be helpful in reaching some of our gift-giving donors. Jill is currently concentrating on congregations, focusing on the top 40 gift-giving congregations in the Sacramento area. She is working to discover ways to connect with church leaders and missions or youth group directors who are familiar with Heifer and would be interested in using these materials for fundraising events with their congregations. She will be tracking the past and present activities of local congregations and will ask us to do some further outreach in our community. Heifer headquarters recognizes the value of study tours, especially for their dedicated volunteers and big donors. More information will be coming out soon about countries with Heifer projects that volunteers may be able to visit. Possibilities are Honduras, Nepal and Ecuador. Haiti will probably not be on the list. There will be a 6 to 12 month lead-up time and volunteers will commit to share their experiences from the study tour and further promote at home Heifer’s work. The GERK materials are now available only on line, except for limited situations, and easily downloadable for use by anyone interested in them. Materials are downloadable and available on Heifer’s newly revamped Read To Feed website. Check it out. Beth Erikson, Professor at CSU Sacramento in Recreation, Parks and Tourism will visit our meeting in October. She will explain her program so we can discuss some ways we might want to partner with her students for event planning. We have the Heifer table in Davis fairly well staffed for September and October. In November, our volunteers will evaluate our impact there and decide whether to continue in the coming year. Laurie Heller has been invited by Heifer HQ to be on the nomination committee for the Golden Talent Awards. She will give us updates on countries, groups or individuals being considered. Susan Sundell reminded volunteers to support Soil Born Farms by attending their 10th Annual Fundraiser Autumn Equinox Celebration on September 22nd. Information and tickets are available on line at www.soilborn.org. Suellen Rowlison discussed and handed out information, flyers and buttons promoting a “yes” vote on Proposition 37. Proposition 37 would require the labeling of genetically engineered food. More information is available on the website: www.carighttoknow.org. Jill recently toured country programs in Kenya with a group from the AKA sorority. She described a hilly, lush land with horrific roads that took hours to travel even short distances. Her group visited a school where children nearly blind from some unknown cause were being educated before they lost their eyesight entirely. Especially interesting were examples of Heifer’s East Africa Dairy Development project. Jill explained that Heifer is working to empower dairy farmers to double their milk production and develop refrigeration cooperatives so that farmers can get more milk to market. This is being made possible with a $42.8 million grant from the Gates Foundation. Heifer, as lead NGO, is working with nearly 180,000 farmers in Kenya, Rwanda and Uganda, providing training and facilitating the connections. Project partners are able to move beyond the limitations of subsistence farming by connecting to larger markets and better opportunities. Our thanks go out to Jill for sharing her beautiful slides, latest information and personal experiences on this study tour. Monday, October 1, 2012, Campus Commons Board Room 6:00 pm. 0 Response to "September 10 Volunteer Meeting Notes"